2. What are Iron Supplements? 3. Why Do You Need Iron Supplements? According to the World Health Organization, iron deficiency is mainly responsible for approximately 81 million cases of anemia . Besides, regarding the inadequacy of different minerals, iron stands at the top of the record. It is a terrible fact, as we know that iron plays an essential role in our body, especially children’s and women’s. To cope with this, one of the most common ways is to use the iron supplement. However, not all types of supplements are the same. Let’s find out what is the best liquid iron supplement and its advantages over other types! To make it as simple as possible, iron supplements refer to a type of blood builder supplement which makes it easier to carry enough oxygen in your body. In normal conditions, oxygen can travel to all parts thanks to a sufficient amount of oxygen in your red blood cells. However, due to some problems, you might suffer from the lack of iron. That’s when iron supplements come to fulfill their mission. Regarding the recommended dose you should take per day, you should read more in our comprehensive guide on HOW TO BUY THE BEST IRON SUPPLEMENT FOR DAILY CONSUMPTION! It provides extensive information on this topic to make you aware of both pros and cons of iron supplement. Why Do You Need Iron Supplements? There are numerous contributors to iron deficiency. However, in general, you should pay attention to 3 main types: massive blood loss, poor absorption, and low iron diets. In your body, iron is present in your red blood cells, which are responsible for carrying oxygen to everywhere. Therefore, we need iron from foods, for example, iron-rich vegetables. The lack of iron from the diet will force your body to use up all reserves. As a consequence, your body does not have enough iron to circulate oxygen, which causes anemia . The severity is worse as many people often consider these symptoms as results of stress or laziness. In other words, they ignore their significance and then, miss the chance to address the real problem on time. Iron supplements can be available in two different forms: ferric iron and ferrous iron salt combinations. As ferrous iron makes it easier for your body to absorb, it is more commonly prescribed. On the market, you can find it in the form of liquid syrup, an elixir, or drops. The supplement of ferrous sulfate has 20 percent being elemental iron, which is available for human absorption. Liquid iron is among the most popular one. However, when it comes to liquid iron, you need to shake it well. The recommendation is to use liquid iron supplements when your stomach is empty. It will help to boost the absorption of iron supplements. On the other hand, the National Anemia Action Council suggested that ferrous sulfate possibly results in constipation and nausea. Learn how to choose THE BEST IRON SUPPLEMENT FOR ANEMIA WITHOUT CONSTIPATION! So, pay attention to the dose and listen to your doctor before using any supplements! Do not forget to check our guide on HOW TO TAKE IRON SUPPLEMENTS FOR BEST ABSORPTION to make sure that you are taking the best advantage of them! The liquid iron supplement has got massive attention from customers over the last few years. It helps people deal with iron deficiency without forcing them to eat foods. Following are top 5 out of the best liquid iron supplement you can find on the market right now! The best liquid iron supplement that we would like you to know is from Wellesse. In addition to quick absorption, it is a tasty supplement to satisfy your taste. Wellesse liquid iron supplement aims to raise the level of iron in your body and reduce annoying symptoms, including fatigue, because of iron deficiency. With each tablespoon, this supplement provides you with 18 mg of elemental iron. Its quality is undeniably excellent. You can store the supplement either in the fridge or out in the room temperature. Therefore, it is quite simple to get it, whether you are at home or work. Its amino acid chelate is absorbable. Furthermore, it lowers the likelihood that you suffer from gastrointestinal problems. Overall, this is an excellent choice for people who do not receive enough iron from their foods. It is useful to deal with iron deficiency most flexibly and conveniently. The liquid form allows you to avoid any discomforts from swallowing tablets. For the best safety, children should stay far away from this product. 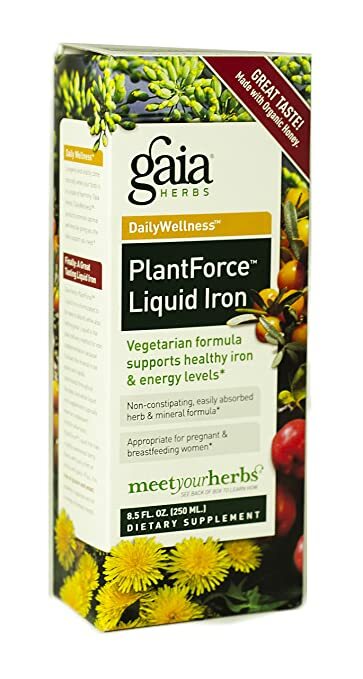 The best liquid iron supplement from Gaia is the most suitable option for pregnant as well as breastfeeding women. They are among the most vulnerable when it comes to iron deficiency. However, a sad fact is that they cannot use any product on the market. Otherwise, their health and the baby might suffer. Therefore, it takes a lot of time and things to consider. But you can solve them quickly with Gaia herbs plant force liquid iron supplement. Though, the suggestion is to contact your doctor before using it. Also, it contains a nonconstipating formula, which means that there is no risk of constipation after using this product. 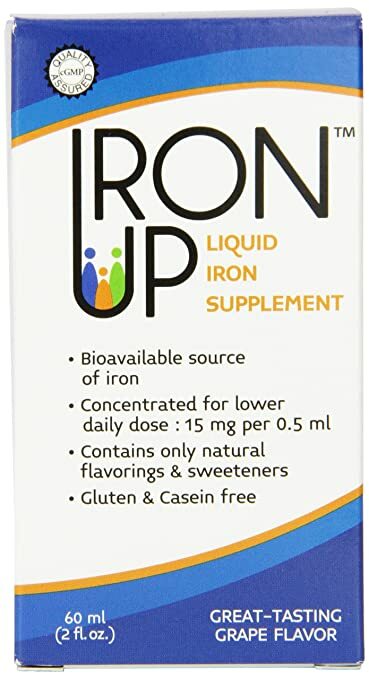 Like other iron supplements, the main benefit of this liquid iron supplement is to balance your iron levels and help you achieve the best energy. Its pleasant taste is a combination of honey and organic fruits, so you can quickly consume it a few times on a daily basis. Another name in the list of the best liquid iron supplement is from Yasoo health group. The most significant point of this product is its excellent taste with the flavor of the grape. You will love it right at the first time you try. All sweeteners and flavorings the manufacturer uses in this product are entirely natural. Therefore, some parents have already used this iron supplement for their children and the results are positive. No case of danger has been recorded, but you should not be overconfident. Remember to take advice from doctors whenever you want to use the iron supplement. Besides, it is suitable for those who prefer using a small dose, instead of massive amount. It is economical and may suit the budget of many people who are struggling with iron deficiency. The amount of iron you receive from this product comes from a bioavailable source, so there is no risk of the use of it. Even though eating only vegetables brings many positive changes in our life, vegetarians are among the most sensitive groups with a high possibility of developing iron sufficiency. To tackle this problem, Floradix is the best liquid iron supplement vegetarians could find on the market. It is particularly appropriate for their lifestyle. 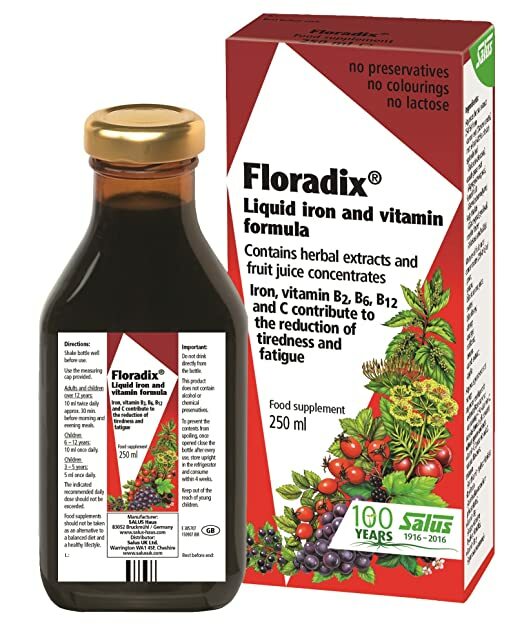 However, it does not mean that Floradix iron supplement is not suitable for other groups of people. In fact, women, whether pregnant or breastfeeding and toddlers can use it to get more minerals and vitamins for their body. Those who have problems with the iron level due to diet also find this supplement superb for them. Overall, it is a major component to help people achieve the balance of vitality and well-being again. You will find extracts of rose hips and wheat germ in this product. Besides, many other ingredients make it super tasty when you consume it. Choosing this product, you have the opportunity to absorb organic iron easily and efficiently from reliable herbs and fruits. The manufacturer has spent a lot of time and research on selecting the best ingredients to support human health. As the manufacturer claimed, this product does not contain artificial flavorings, preservatives, and alcohol. So, you can expect it to boost your health to the fullest extent. Some people might wonder why vitamin C is present in the iron supplement. Here is the answer. According to many studies, vitamin C has great influence on our absorption of the iron supplement . Therefore, the best liquid iron supplement also needs to include this special vitamin. As a result, you will get many more benefits from it. Nelson homeopathics supplement is outstanding because of its wonderful apple taste. This is not to mention the combination of iron and vitamin C to enhance your well-being. Besides, it has a different advantage when you can easily bring it along in the form of conveniently daily sachets. Worry no more about using the supplement when you are not at home, right? Taking supplements is not a thing that you can do carelessly. Without proper use, they might damage your health from now on. Thus, it is necessary to be alert when you use supplements. The suggestion is to use supplements when your stomach is empty. It would have great impacts on your absorption. And the best time is about 1-2 hours before you have meals. Read more about HOW LONG DO IRON SUPPLEMENTS TAKE TO WORK to understand the mechanism behind it! However, if this makes you feel sick, you can choose to consume it after meals. The absorption would be more difficult, but your health will not be harmed. The absorption of iron would become better with the presence of vitamin C. That’s why you usually see vitamin C as a component of the best liquid iron supplement. In addition, you can add more vitamin C into your diet on your own. You should take some recommendations which provide you with great amount of vitamin C, such as oranges, strawberries, potatoes or broccoli. While vitamin C-rich foods are good for iron absorption, there are some foods which stand on your way to achieve the balance. You need to stay away from cow’s milk, caffeinated drinks and antacid supplements at least 2 hours after using iron supplements. This allows your body to absorb iron in the best way. The lack of iron causes so many problems and so does the over-consumption. When your body gets too much iron, it will suffer from many unwanted impacts. At this stage, you need to ask your doctor for advice immediately. Some early symptoms are fever, diarrhea and vomiting. Later, they might develop into fast heartbeat, breathing troubles and weakness. Obviously, taking iron supplements, whether liquid or tablets, is a simple way to rebalance your iron level. However, if you look for a long-term way to fix this problem, then you can be more concerned about other alternative ways. It is not strange. After all, everything you need to do is to consider an iron-rich diet which includes some particular foods. Poor diet is one of the main catalysts for anemia, so why don’t you start treating the problem from its root? As a matter of fact, most experts recommend this natural method over using over-the-counter supplements. They are natural, safe, and efficient in the long term. But before starting, you need to know that there are 2 different types of irons in foods. One is heme which your blood finds it easier to absorb. The other is nonheme with inferior absorption. You can get more information in our list of THE BEST HEME IRON SUPPLEMENT! Here are some foods that you want to get immediately in your daily diet. They will boost your iron level without any side effects. We hope that with our list of the best liquid iron supplement, you can find the most suitable option for yourself. You should never forget the importance of iron in your body, which might urge you to absorb it from foods every day. If you can maintain that habit, you will not need iron supplements which are sometimes costly and inconvenient. LIKE and SHARE our article to inform other people of the news and encourage them to prevent iron deficiency in advance!